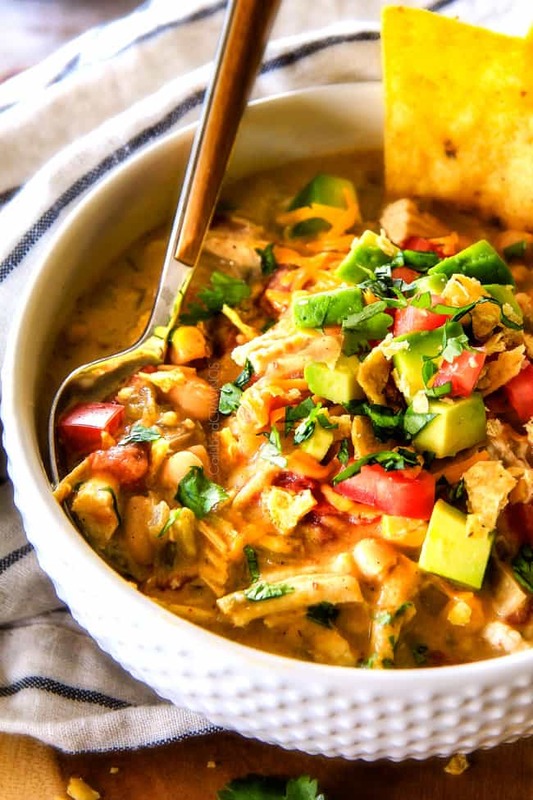 This Crockpot Creamy White Chicken Chili is about to become your new favorite easy, White Bean Chicken Chili Recipe – AND it’s lightened up and won 5 best chili awards – and counting! This Crockpot Creamy White Chicken Chili recipe is sooooo creamy (without any heavy cream! ), comforting, wonderfully hearty, and the layers of flavors are out of this world! It’s almost dump and run for the ideal easy weeknight dinner or fabulous for crowds! So even if you have never tasted White Bean Chicken Chili before, it is guaranteed to have your family and friends begging for more! I’ve been counting down the days to soup season – and slow cooker season – my favorite “food” season of the year – so I could finally post this White Chicken Chili Soup recipe! 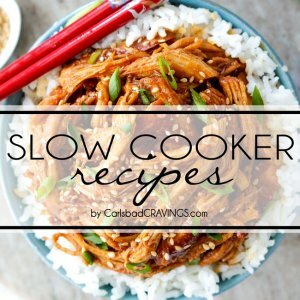 Not only are slow cooker recipes fantastically easy and fill every nook and cranny of your home with anticipated savory deliciousness all day, but they taste as if you have been slaving away all day when nothing could be further from the truth! (Check out my slow cooker recipes HERE). Soups are also one of my favs – so comfortingly delicious and they generally only require one pot, are a meal in one, boast layers of complex flavors from simmering, reheat beautifully for leftovers, and require hardly any “hands on” pep time – winning! 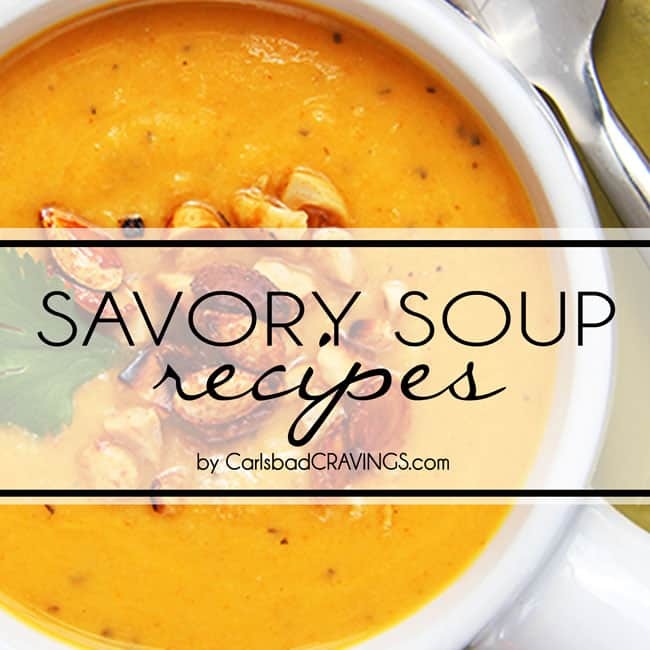 And my absolutely favorite types of soups – slow cooker soups! If anyone ever tells me they “can’t cook” or “don’t have time to cook,” I tell them to check out my slow cooker soups! 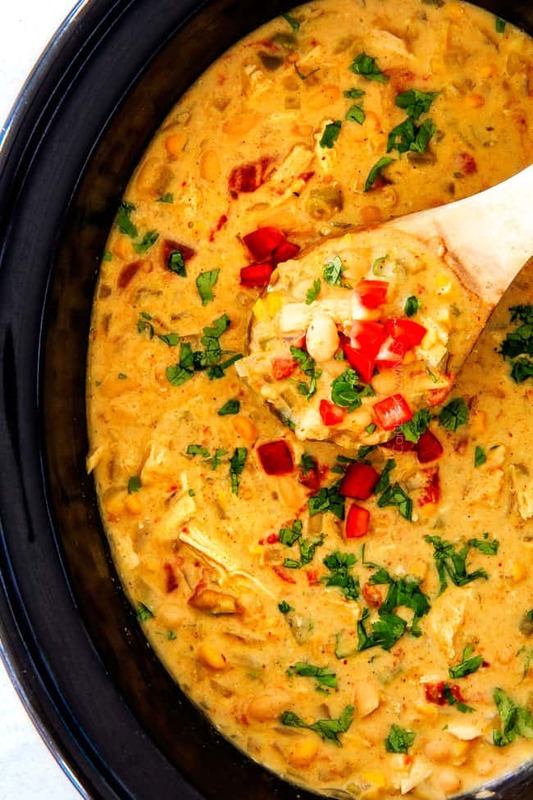 Some of my favorite slow cooker soups are Slow Cooker SKINNY Potato Soup, Slow Cooker Thai Coconut Chicken Wild Rice Soup, Slow Cooker BEST EVER Beef Stew, Slow Cooker Bacon Ranch Chicken Chowder my Cheesy Broccoli Chicken Rice Soup– and now I’m adding this Slow Cooker Creamy White Chicken Chili to the top of the list. Its epic. (Check out my soup recipes HERE). What is White Bean Chicken Chili? This White Bean Chicken Chili is bursting with everything that makes White Chicken Chili delicious – and then some: tender shredded chicken, creamy, hearty beans, warm fiestalicious spices, tangy bright green chilies and aromatic fresh cilantro. 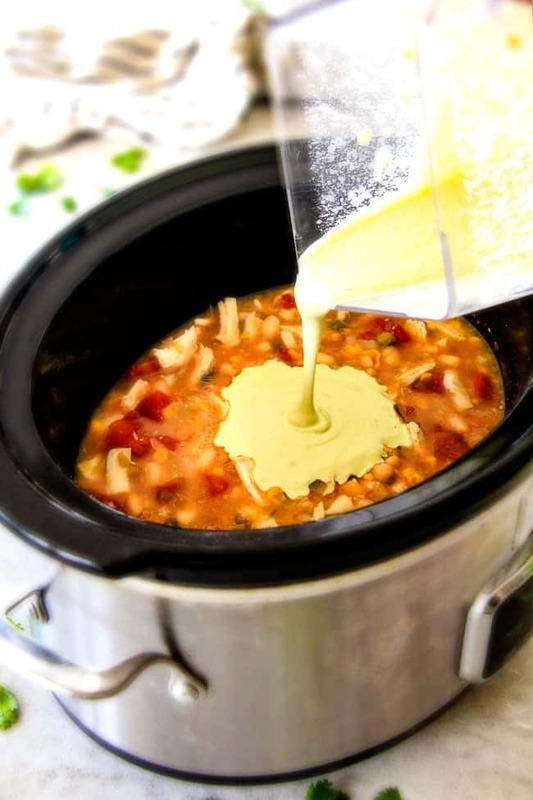 But to make this truly epic Crockpot White Chicken Chili – its creamified! Because nothing says ultimate comfort food like warm, creamilicious soup. And because this soup is so knock your socks of delicious – you are going to want to eat bowl after bowl after bowl – which is why I’ve used a “skinny” method to make this soup rich and creamy. Lightly spray slow cooker with nonstick cooking spray. Add chicken in an even layer followed by all our remaining slow cooker ingredients of Great Norther Beans, low sodium chicken broth, onion, diced green chilies, diced tomatoes, cream style corn, jalapenos, garlic and our warm fiestalicious seasonings. Give the top ingredients a stir to combine. Cook on LOW for 6-8 hours or on HIGH for 3-4 hours or until chicken is tender enough to shred. Remove chicken to a cutting board, shred chicken and return chicken to slow cooker. Turn Slow Cooker to High (if it had been on Low). 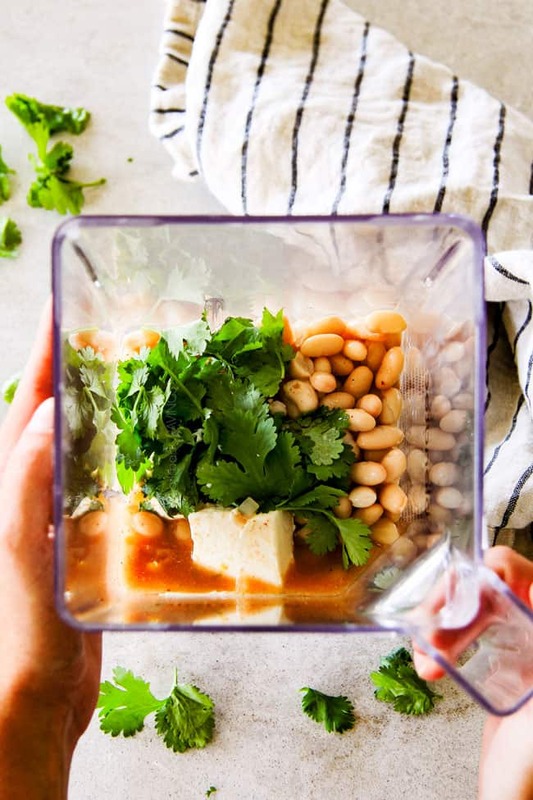 Remove 1/2 cup broth and add it to your blender along with 1 can beans, 1/4 cup cilantro, light cream cheese and 2 tablespoons cornstarch. Blend to create a smooth puree then add this back to the soup along with your chicken. Cook for another 30 minutes and your soup will emerge soooooo wonderfully creamy. Then go crazy on the toppings! 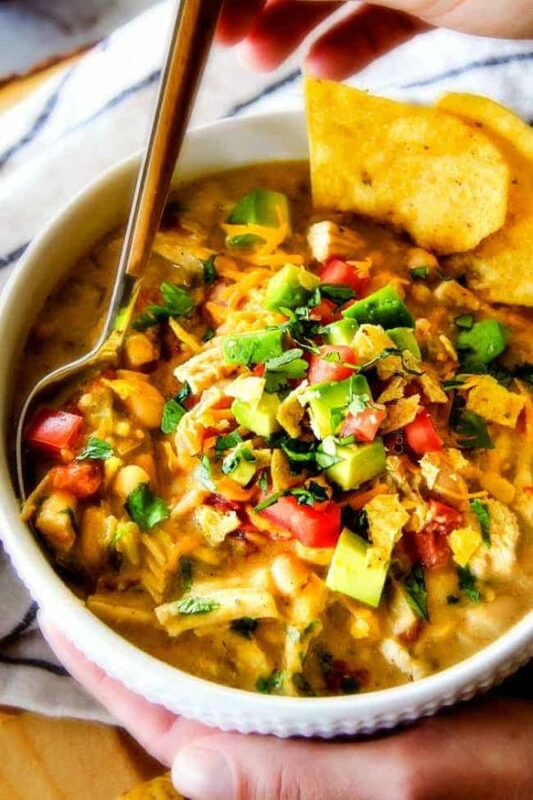 What toppings go with White Bean Chicken Chili? Tips to make Creamy White Chicken Chili Lightened Up! I lighten up this Slow Cooker White Chicken Chili with my favorite method for making soups “skinny” – I use a can of cream-style corn as part of the soup base instead of heavy cream! Its natural creaminess is a life changing secret ingredient! We get even creamier by blending 1 can of beans, light cream cheese and 2 tablespoons cornstarch together until smooth then adding it back to the slow cooker. This trifecta is perfection at producing creamy soups. We cook the soup on HIGH for another 30 minutes so the cornstarch can activate and the soup can thicken even further. And because we’ve saved a load of calories by not using heavy cream, we can afford to indulge in toppings. Lots and lots of toppings…cheese, avocado, cilantro, tomatoes, sour cream, tortilla chips etc. all your favorites in one bowl. An epically delicious bowl. 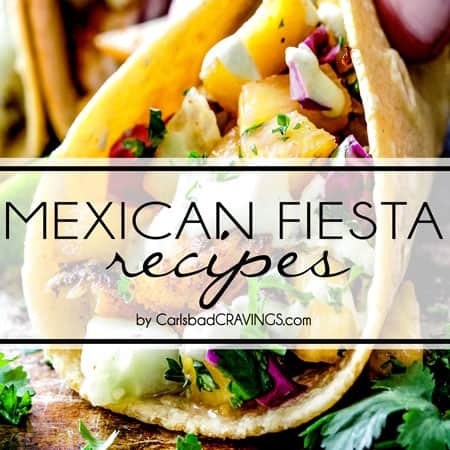 Looking for More Mexican Soup Recipes? 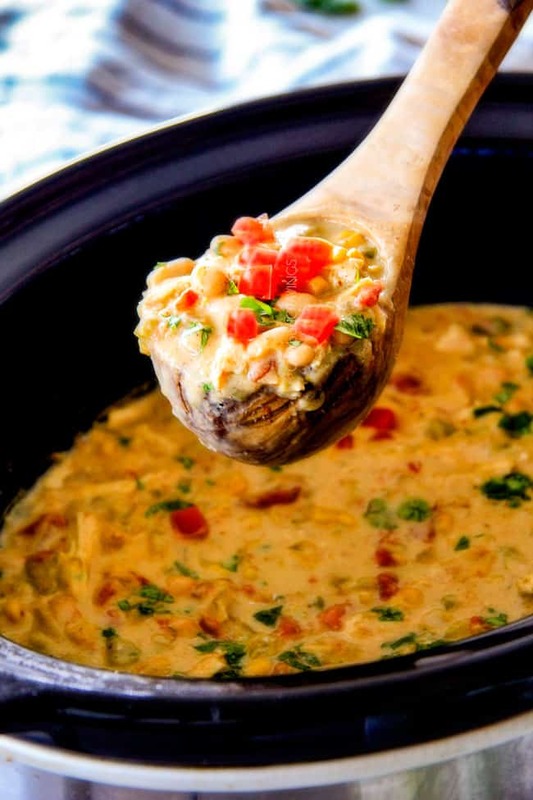 Want to try this Crockpot Creamy White Chicken Chili Recipe? 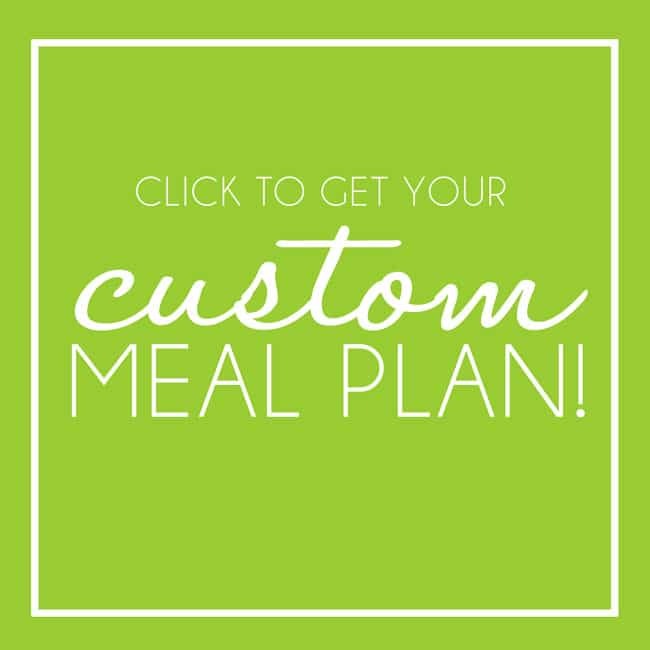 Pin it to your SLOW COOKER, SKINNY, SOUP, MEXICAN or DINNER Board to SAVE for later! This LIGHTENED UP Slow Cooker Creamy Chicken Chili is about to become your new favorite easy White Chicken Chili recipe! This Crockpot White Chicken Chili is sooooo creamy (without any heavy cream! ), comforting, wonderfully hearty, and the layers of flavors are out of this world! Lightly spray slow cooker with nonstick cooking spray. Add chicken in an even layer followed by all remaining slow cooker ingredients. Give the top ingredients a stir to combine. Cook on LOW for 6-8 hours or on HIGH for 3-4 hours or until chicken is tender enough to shred. Add all Blender Ingredients to a blender including 1/2 cup soup from slow cooker (try to just scoop out broth). Blend until smooth. Add puree back to slow cooker and stir to combine. Cook on HIGH for 30 minutes. Season soup with salt, pepper and hot sauce to taste. Top individual servings with desired toppings. Enjoy! have any suggestions how I can adjust recipe to suit. Hi Tricia, welcome to White Chicken Chili – I think you will love it! In the place of the creamed corn you can use chicken broth but the soup won’t be quite as creamy (but you could add extra cream cheese) or you can puree some corn with a small amount of milk. Hope that helps! Cannot find “Print” option for recipes. Hi Anne, the print button is located in two place – just below the post title and if you scroll down to the bottom and are looking at the actual recipe then there is a Print Icon (picture of a printer) just above and to the right of the recipe title. Hope that helps! 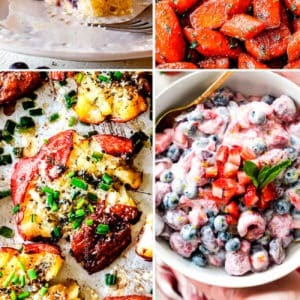 Can you post the calories for this recipe? I’m on a diet and counting calories and this looks yummy! 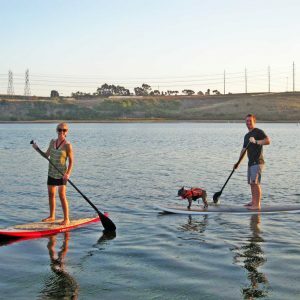 I enjoy your blog..my best friend lives in Carlsbad so I turned her on to you too! Where do you find ancho chili powder. I looked in the MX aisle of three grocery stores. Maybe a small MX grocery store? I added rinsed and drained black beans for contrasting color and left out some of the white beans. Hi Shelley, it should be with all the other spices – even my Walmart carries it. I usually get the one by McCormick. My local grocer carries it in the bulk foods and spices section. made this last night with some leftover smoked chicken from the day before and it was great. I look forward to having it many more times as the colder months approach. You are so welcome Dale, I’m so happy you enjoyed it! Sounds perfect for the upcoming cold months! Made this yesterday and it is outstanding. My wife enjoyed it immensely and my son ate 3 bowls of the soup. We have lumped this into the category of recipes that are so good that we want to share it with friends at parties or pot lucks. Thanks for such a great recipe. Awesome Jim! I am thrilled your family loved this recipe so much and making it into the “want to share” category is the highest compliment – thank you! I made this last night for my family and we all loved it. I am so glad I came across your website because I have loved all the recipes I have tried. Quick question, do you happen to have a regular chili crockpot recipe coz I would love to try it if you have one. Thanks! I am so happy your family is loving my recipes, thank you! I actually don’t have a regular chili crockpot recipe but I will get one in the works! It has been on my “to make” list for a while now- time to move it to the top of the list! Thanks for another winner. What an amazing way to thicken a dish. I didn’t have time to make this in a crockpot so I simmered it on the stove. It was wonderful! Have a spectacular day Jen! You are so welcome Allie, thank you for another make-me-feel-good-comment! I’m so glad you were able to easily adapt this to the stove and it was a hit! Did you grill or cook the chicken in any way before you put it in the slow cooker? Nope, super easy, just add it uncooked. Enjoy! I can’t have dairy. Do you think this would turn out ok if I used full fat coconut milk? Hi Rachel, I am honestly not sure as it will definitely have a coconut taste to it. 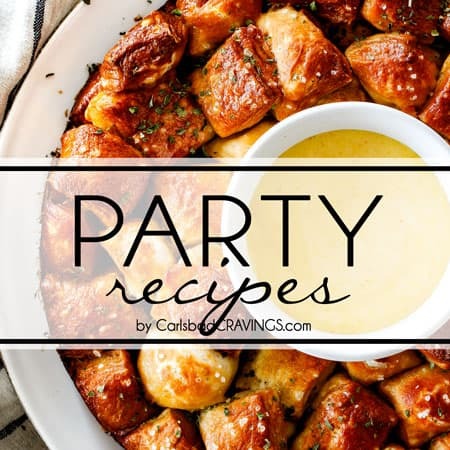 Instead, I would add 3 tablespoons cornstarch instead of 2 in the blender ingredients to make up for the lack of thickening from the cream cheese. Hope this helps! I made it with daiya cream cheese because we can’t have dairy either, and it turned out great! Oh good! Thank you for the tip! I made this two nights ago and have been enjoying it every day since. So so good! Followed the recipe almost to a tee. The only difference is I left the chicken to the end. I rubbed it in chili powder, cumin, garlic powder, salt, pepper and brown sugar. BBQ’d the chicken breasts, chopped them up and put them in the soup at the end. I’m just not a fan of the texture of slow cooker chicken. It turned out sooo good! Such a nice, hearty, healthy recipe! Will definitely make again. Hi Shannon, I’m so happy you loved this recipe and the leftovers as well! 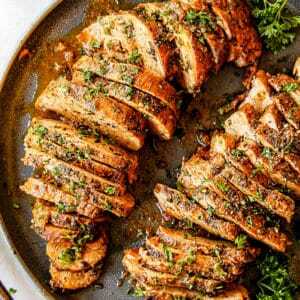 Your method of using barbecued spiced rubbed chicken sounds absolutely wonderful! Your cooking is incredible! 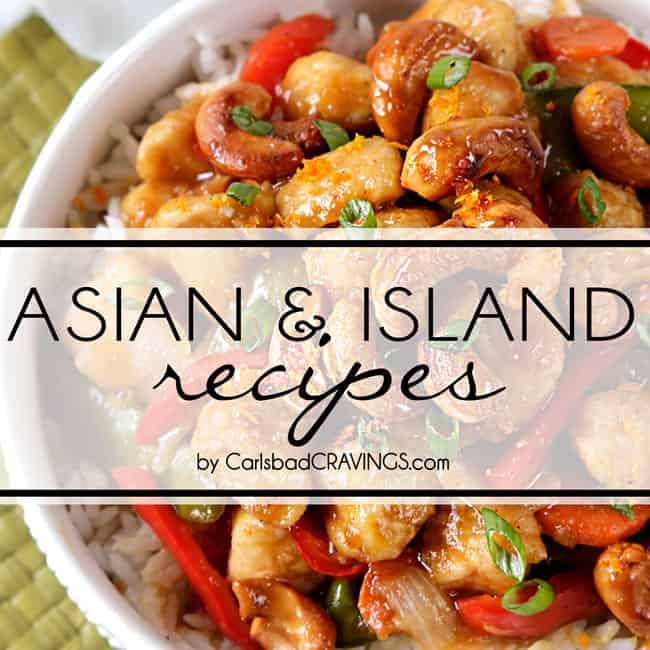 I found your site a couple of months ago and several of your recipes have already become family favorites. My ten-year-old daughter drools over this chili and my whole extended family adores your Thai Chicken Noodle. Thanks so much for sharing your wonderful artistry. Yum!! What a kind comment, thank you Shalise! 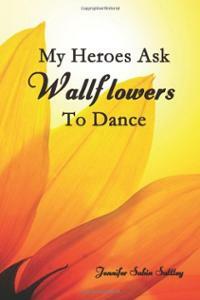 I am so happy you stumbled across my blog and have already found new favorites! 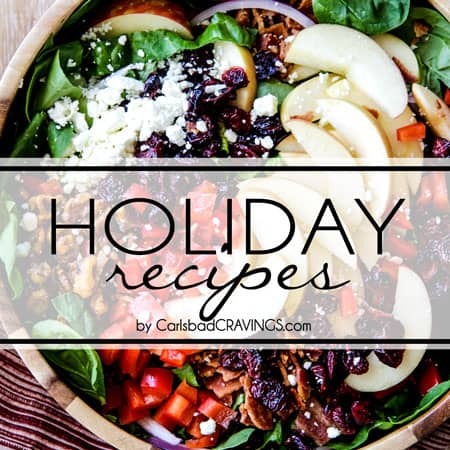 I hope you continue to find more and more recipes your whole family will love! I made this amazing chili for some out of town company and they couldn’t stop raving about it. It was so delicious! Definitely a keeper. Thanks Jen!!! Can you make this using frozen chicken breast or should they be thawed out first? I finally got a chance to make this tonight. It is amazing!! Super amazing!! I think this is my new favorite chicken chili recipe. Thank you so much for sharing this one, it is a keeper!!! Also, when I told my family that I got this recipe from your site, they all got excited. 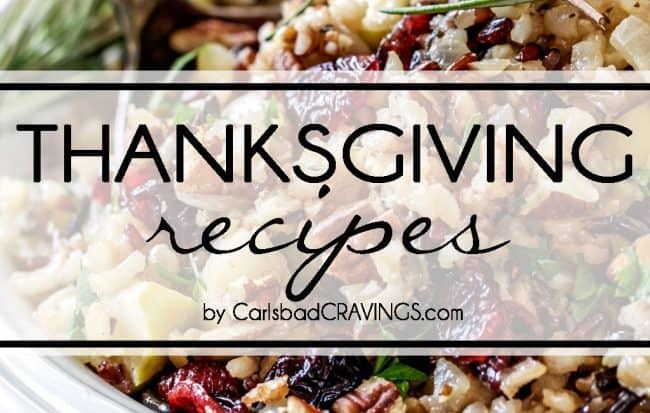 ‘Carlsbad Cravings recipes are always SO good!’ Haha. You are so talented!!! Also, just for anyone checking comments for tips: I actually made this in a Dutch oven instead of a slow cooker. I have a crock pot but I’m not crazy about the way mine cooks chicken. 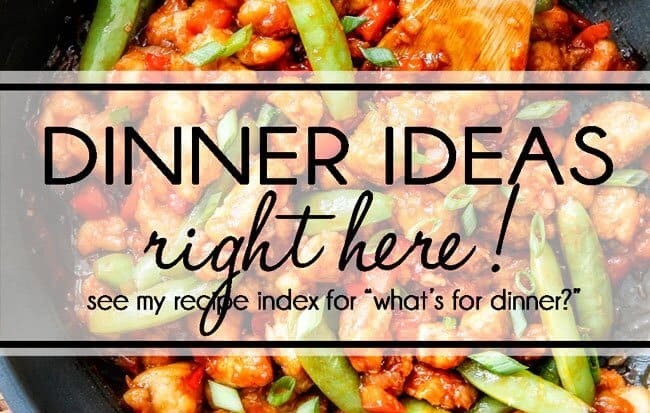 So if you don’t have a slow cooker, you can still totally make this and it turned out amazing!! Thanks so much for the huge compliment Laura and for taking the time to comment, it’s nice to know your entire family is loving the recipes! P.S LOVE the dutch oven idea, thanks for sharing! Another home run recipe!!! This was so amazing!!! LOVED LOVED it! We added lime tortilla chips. So good! This is on the menu for our next freezer party!!! I just had lime tortilla chips so I can totally imagine that amazing combo right now! Thanks so much Therese! 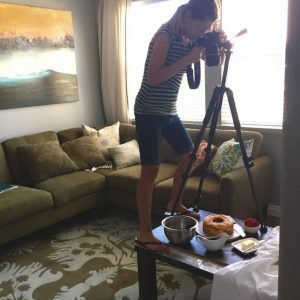 I love hearing what recipes you have tried and loved! I love so many of your recipes and made this one last night and it was great. However, for two people I made way too much and wondered how long it would keep in the fridge and also if it would still taste good after freezing? It is too delicious to let it go to waste! Hi Elizabeth, I’m so happy you are enjoying my recipes! I think it should last for about one week in the fridge. Generally anything with dairy doesn’t freeze particularly well because the texture gets funky, sorry! 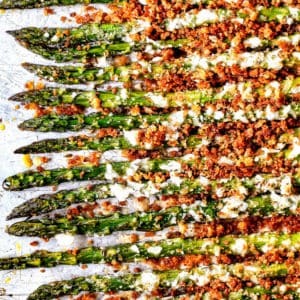 Any idea on how to prep this for eating the next day (potluck lunch at work)? Does it cook and reheat well? Hi Lisa, this soup reheats beautifully, and tastes even better the next day in my opinion! So I would just make as usual then reheat. Enjoy!